An accessible and informative guide to physics, chemistry and biology, how they work and how they apply to everyday life. Covers all the key science topics including electricity, the periodic table and the human body. Includes simple experiments and internet-links to recommended websites to find out more. Illustrated with humorous drawings, cartoons and diagrams. 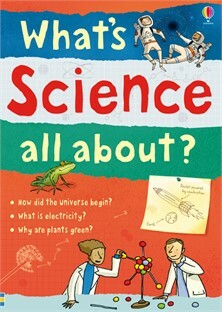 This book contains the following Usborne titles: What's biology all about?, What's chemistry all about? and What's physics all about? I enjoyed the book because it was helpful as a detailed summary of the three different sciences, helping me to understand things I couldn't originally get my head around. Its use of facts, pictures and short paragraphs made it easy to read. It was more entertaining and less tedious than a normal science textbook... The activities were simple and easy to achieve, with informative instructions that also make it easier to see what you are learning.